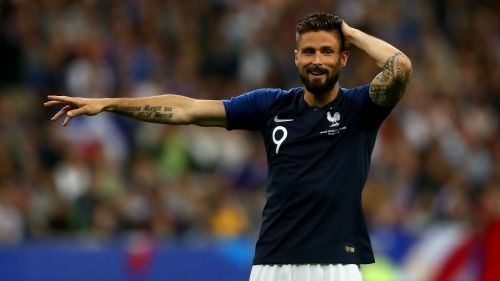 Olivier Giroud declared himself satisfied on a personal level after matching the records of two French legends during Monday's 2-0 friendly win against the Republic of Ireland. Giroud won his 72nd cap to equal the appearance haul of Michel Platini, while his opening goal saw him pull level with Zinedine Zidane on 31 for the national team. Nabil Fekir scored France's second in a match they totally dominated in Paris, and the only frustration for Didier Deschamps will be that his side did not score more goals. "It's satisfying on a personal level, even though I did not have many opportunities tonight," he told TF1. "I felt good in my legs, even if we could not quite finalise our efforts during this match. "I will remember especially the very good mindset and the very good start we made. We showed a lot of character, the desire to impose our game. "We knew their qualities but we were sure of ours too. That's good, but we can improve. We could have been more dangerous, scored more goals, but in any case I think we had a lot of fun tonight." Discussing Giroud, head coach Deschamps added: "He has been effective with us for a long time. This is what is asked of an attacker. "He has other qualities too, but at the international level, he is part of a closed circle. He is a player unfairly and too often criticised. "He does not have the qualities of other attackers, but his style of play allows the team to have sequences, which does not prevent him from being effective."